Pamela Buck holds a both a Bachelor and Masters music degree in Violin Performance from Michigan State University. 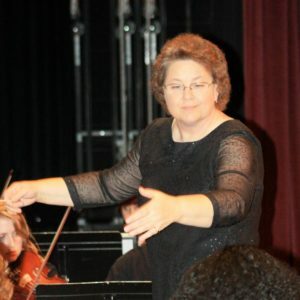 She spent 13 summers studying at Interlochen National Music Camp in Traverse City, Michigan and served as Concertmaster, string coach and violin soloist with the Diablo Symphony Orchestra in Walnut Creek, CA from 1983 to 1996. During these years she was also the conductor of the Young Performers String Orchestra, an East Bay area organization of elementary and intermediate string players. Prior to moving to the Sacramento area in 1996, Pamela Buck was awarded a City of Walnut Creek proclamation for her dedication to the City’s musical arts. She was also awarded the 1996 Women of Achievement Award for Music in the East Bay. She is a well known violin, viola, strings class and piano teacher in the area, spent five years teaching at Natomas Charter School Performing and Fine Arts Academy, and has conducted a successful Youth Orchestra Camp through Community Education at Sierra College in Rocklin for the past 15 years. Pamela is currently an Instructor of Applied Violin – Chamber Music at Sierra College, the general music teacher at Brookfield Preparatory School in Sacramento, a professional violinist with several Sacramento area orchestral groups, and will be the Principal second violin of the Folsom Lake Symphony Orchestra this season. Pamela teaches strings, keyboard and general music classes in private, charter, and public school enrichment programs throughout the Sacramento region and is a dedicated teacher to music education and performance.